I painted Wisdom by using the symbol of the totem pole as the ancestral roots that provides us with the fundamental knowledge we grew up with. 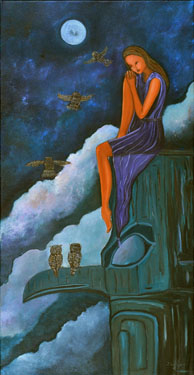 The owls symbolize the wisdom that we accumulate through our life lessons. I believe that wisdom is gained through experience, we learn by living and making choices. One of the most effective ways I have learned in gathering wisdom is how to solve any and all problems by asking intelligent and empowering questions. With constant growth, I trust that we can all grow to be larger than any of our problems.